The shadows of nearby high-rise buildings partially shrouds the old Kuching General Post Office on a recent sunny day. The former post office does not come under present heritage laws as it is less than 100 years old despite being its significance to local heritage and history. 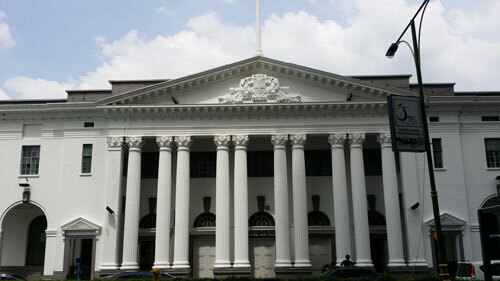 STANDING tall in the heart of the Main Bazaar along Jalan Tun Abang Haji Openg is the old General Post Office. Built in 1932 by the third and last White Rajah of Sarawak Charles Vyner Brooke, the building still looks as majestic and grand as it was when it was first opened. In part, this is because it was still being used and maintained as a post office up until recently. Its neoclassical design and massive columns have been a source of pride for locals – many of whom likely posted mail or collected parcels from there at least once in their lives. Thus, it will come as a shock to many to learn this beloved Kuching landmark does not enjoy protected status under current heritage laws because it is less than 100 years old. There are two laws which presently govern heritage sites and antiquities in the state, Sarawak Heritage Society (SHS) president Karen Shepherd told thesundaypost recently. One is the Sarawak Cultural Heritage Ordinance 1993 (SCHO) while the other is the National Heritage Act 2005 which is applicable to the whole country and covers areas not addressed under the former. However, their existence has not prevented Kuching from losing many of its historical buildings in the 20 years since the SCHO has been in force. One reason is why there is a need for the law to enlarge and further define what heritage is. Many people don’t really understand what heritage really means and why it is more than just about preserving old buildings and historical sites, Shepherd explained. Age is just one of many factors which should be taken into consideration when determining heritage value as heritage is both tangible (buildings, objects, art) and intangible (language, customs, practices). The tangible and intangible aspects of heritage are often intertwined. Changing or removing one aspect will often cause a ripple effect in another. It could result in unintended consequences such as the dwindling number of businesses at Carpenter Street – the result of large projects in the Main Bazaar area which not only altered the flow of vehicle and foot traffic but ultimately resulted in a drastic change of culture, Shepherd pointed out. The colourful archway marking the entrance to Carpenter Street. Large-scale projects in the area which altered foot and traffic flow have partly contributed to declining businesses and changed its culture. More than half a century since independence from British colonial rule, the socio-economic and political fingerprints of British influence can still be traced all over the heart of the old city, centred around the Main Bazaar which sits on the bank of the Sarawak River – from the pre-war shoplots, lining the then major thoroughfares (such as Wayang Street, Carpenter Street, Ewe Hai Street and India Street) that formed the lifelines of trade and commerce, to the colonial architecture of the Sarawak Museum, the Astana, Fort Margherita and the old Courthouse complex. However, these vestiges of colonial times can be counted as among the better off. Over the years, a number of their peers have been lost – some forced to make way for development projects while others suffered through careless, garish facelifts which often ended up vandalising the very features which made them unique and for which they were cherished. Many more have simply fallen to the ravages of time and neglect – pale shadows of their former glory and their future existence ever increasing in doubt. Old Kuching lies at the epicenter of the quiet battle between the old and the new as the state government and developers push ahead with an ambitious multi-million ringgit reinvention of the waterfront and Main Bazaar into what it hopes will be a vibrant heritage, tourism, business and entertainment hub. Pre-war buildings like the General Post Office and the New Orleans-inspired building, built in 1907, which houses the present Sarawak Textile Museum, are finding themselves in the shadows of ever larger and newer development projects. At the same time, the collective sense of loss felt by some Kuching residents has been channeled into a collective desire to preserve what’s left of Kuching’s historical buildings and sites and ensure the intangible knowledge and history contained in them are not lost forever amongst the cacophony of modernisation. The Sarawak Heritage Society (SHS) was founded in 2006 by a passionate group of individuals to increase public awareness about the value of preserving heritage sites, encourage interest in local heritage and support heritage conservation initiatives. Recently, the group held a small preview exhibition with Urban Sketchers Kuching called Foretaste to raise awareness on conservation issues. It featured the works of five urban sketchers depicting present day Kuching and the old town of Siniawan. Among scenes captured were the India Street pedestrian mall, the Brooke Dockyard, the old Satok Wet Market before its relocation to Kubah Ria, and Padungan. The small launch held at The Ranee boutique hotel was warmly received with more than 70 people in attendance. Compared to when the group first started, public interest in heritage matters had increased over the past few years, Shepherd shared. “From my personal perspective, there are two sides to it. One, there have been a number of losses over the last few years and people feel strongly about it – the wet market at Gambier Street, the godown, and the Summerhouse at the Museum which had its beautiful stucco work removed. “We saw a number of buildings that have featured very well in our lives – like the cinemas – disappear and I think people were getting to that stage where they felt they would have nothing. Nevertheless, Shepherd stressed that more people needed to voice their opinions and concerns to better influence the decisions of policy-makers and actions of law enforcers in heritage matters. 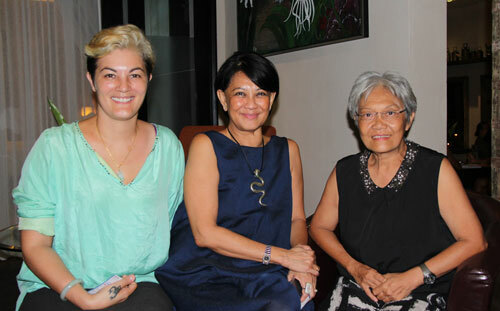 (From left) Karen, Anna and Rose of Sarawak Heritage Society. SHS member and Foretaste coordinator Anna Wee was among those who felt compelled to join the SHS as she saw her beloved city losing more and more of its iconic places and buildings. One of the biggest challenges society faces is changing the way how people perceive and value heritage, including convincing private property owners why old buildings should be maintained instead of demolished to make way for new shoplots. “Unfortunately, many owners do not see the need to maintain even the facade of their buildings as they see no value in it for them,” she shared. This is also partly because there are no by-laws which protect buildings with heritage value nor specify what modifications or renovations can or cannot be done to them. Anna pointed out that by-laws were needed not just to improve the administrative and legal checks and balances but also provide a more secure future for heritage sites which have escaped the touch of demolition or decay so far. “Look at the old Courthouse complex. It has not been well maintained. I’ve organised functions there before and the walls are peeling. You get the feeling that maintenance has become a low priority,” she said, adding that all the Acts in the world will not work if there is no political will. “To preserve heritage you have to involve a large number of people and different agencies – city councils, government, NGOs. If you look to Penang as a model, they have a heritage unit which oversees everything. If the government wants to get really serious about preserving heritage, they will need to set something similar up and to give it some (serious) teeth. “Heritage and tourism can be uncomfortable together but actually tourists come to a place like this because they want to see something that they cannot see anywhere else. Our goal is to help people to see the beauty in their history,” she said. Freelance tour guide Rose Au and director Rosemarie Wong of The Ranee boutique hotel, are firm believers that demolishing the old to make way for the new is not necessarily better when it comes to promoting tourism in the state. For example, certain temples have been dropped from local itineraries following renovation works which have done away with the temples’ unique features. “Fewer guides are taking them there because the temples have lost their aesthetic value,” Rose noted. Rosemarie pointed out that one way of preserving old heritage buildings and antiques is to repurpose them through the lens of modern interior design and contemporary concepts, and where possible, incorporate the old into the new. The Ranee itself is an example of how this balanced and tasteful play between the old and new can greatly add value and create good experiences for visitors. The hotel is situated within two 19th Century shophouses along the Main Bazaar and facing the Waterfront. Taking advantage of its location in the historical quarter, the hotel uses antiques and locally sourced material like pua kumbu in its designs. For example, separating the Ranee’s lobby from the in-house cafe is a partition made from wooden beams recovered from the site during the hotel’s construction phase. “We have also used some of the old beams to make the amenities benches which are placed in our bathrooms. Not only does it impart a unique experience to our facilities but it is also more environmentally friendly as old objects find new life,” Rosemarie added. 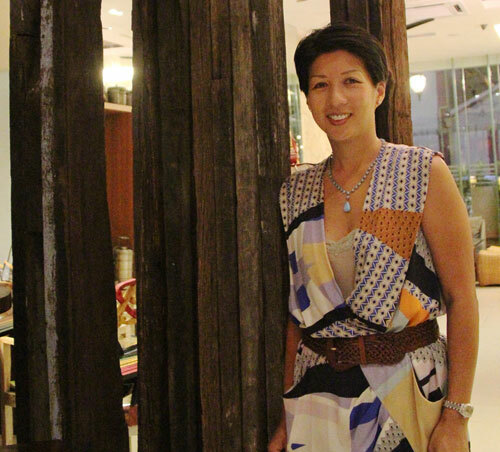 Rosemarie Wong, director of the Ranee, a boutique hotel at Main Bazaar. “The whole point of heritage is not that it’s the past; it’s the link between the past and where we are now. No one is suggesting you stop it in time and nothing can ever be touched. The thing is to maintain the heritage so that it can continue into the future,” Shepherd explained. She encouraged anyone with an interest in Sarawak heritage to consider joining the SHS, including professionals and members from diverse backgrounds and fields, to get involved as it would help society to represent a wider range of opinions, views and suggestions in their efforts to ensure continuity of Sarawak’s heritage. SHS is presently conducting a membership drive and is planning to follow up Foretaste with a series of programmes, public talks and activities over the next few months. To learn more about the SHS or to join their mailing list, email [email protected] The society can also be contacted via their Facebook page Sarawak Heritage Society Shs.